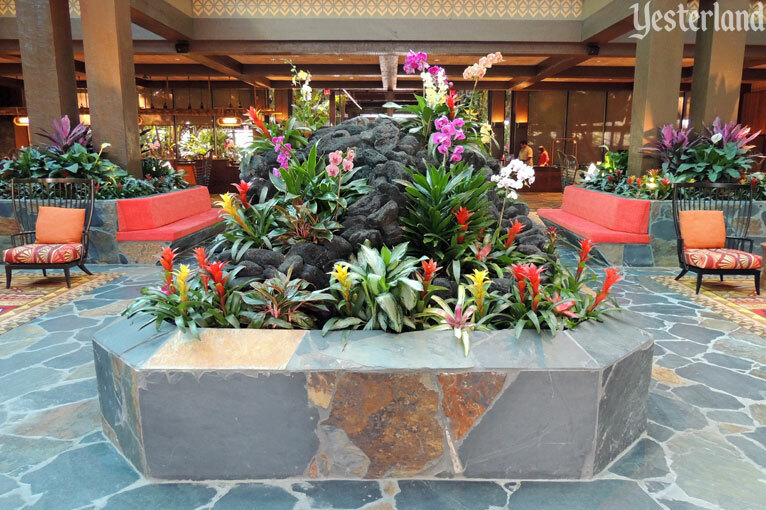 It’s not unusual for a hotel lobby to have a fountain or indoor plants. But the atrium garden in this “Yester World” lobby is one-of-a-kind. Welcome to the centerpiece of the Great Ceremonial House, as it looked for more than 40 years. 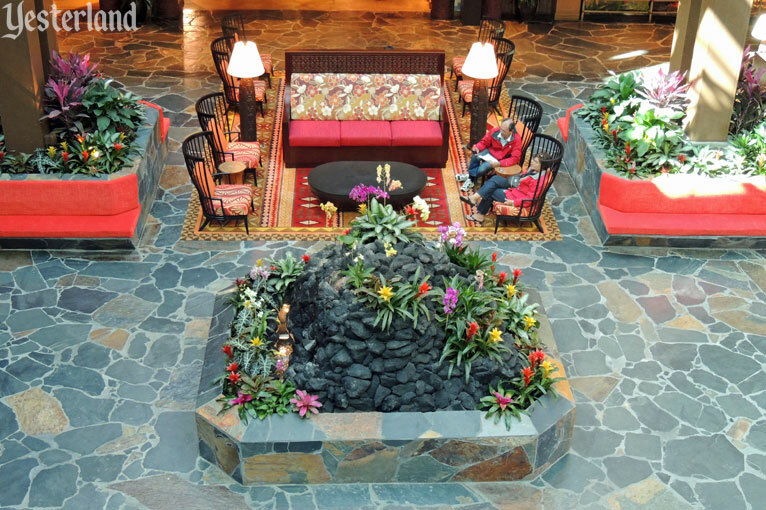 Where other hotels have seating or a lobby bar, there’s a lava mountain with colorful orchids, bromeliads, ginger, and anthurium plants, topped by a canopy of ferns, palms, ornamental banana plants, and other tropical foliage. Waterfalls cascade into small ponds—making the whole small mountain a visual and auditory delight. 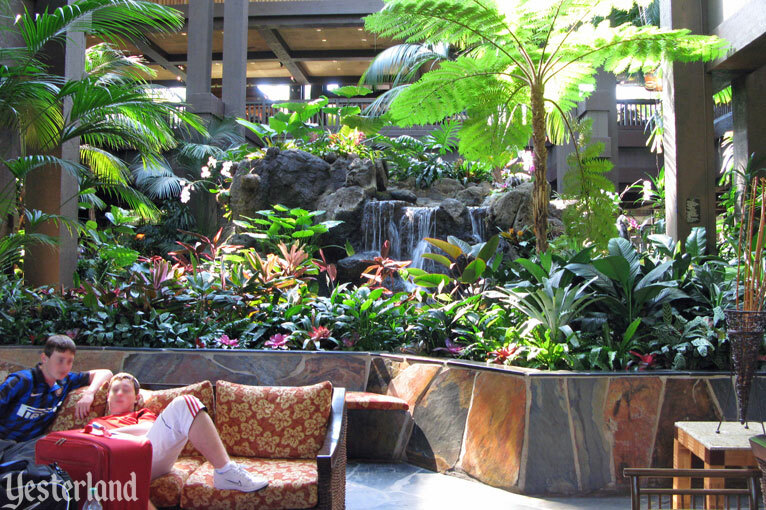 Although the waterfall garden fills much on the lobby, there’s seating too—just not very much of it. When you finish admiring the waterfall garden, take a look in the nearby Wyland Gallery for marine life art by Robert Wyland and other talented artists. Decorate your house with paintings of whales, sculptures of sea turtles, and works featuring Disney mermaid Ariel with dolphins and other marine friends. 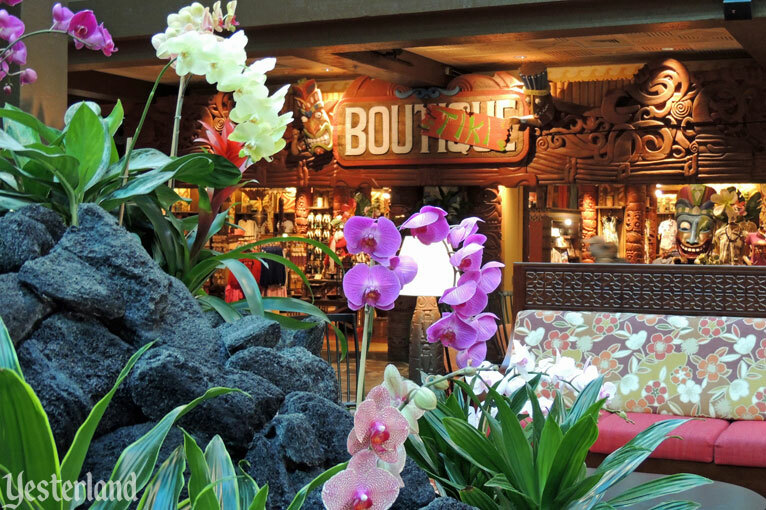 The style of the Polynesian Resort owes more to the tiki bars of the 1960s than to the authentic culture of Polynesian islands such as Hawai‘i. A drummer tiki looks like nothing you would find in Honolulu’s Bishop Museum, but he (and other tikis like him) are a lot of fun. 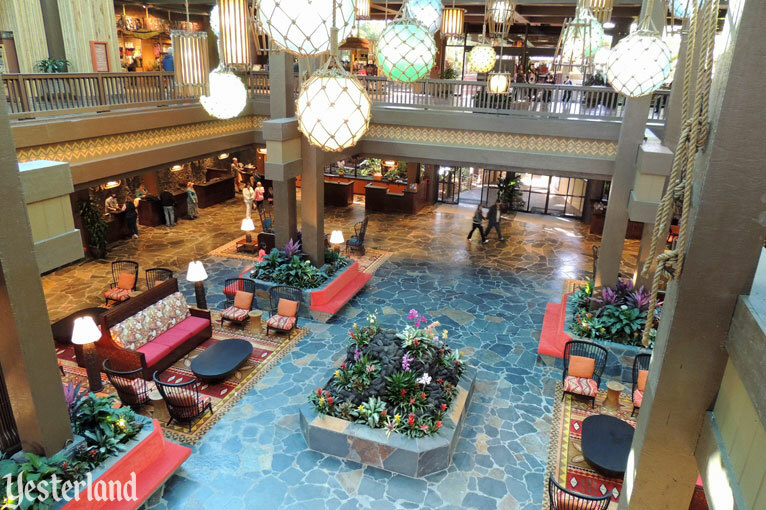 For real Hawaiian culture, Disney has Aulani, a Disney Resort & Spa, Ko Olina, Hawai‘i. 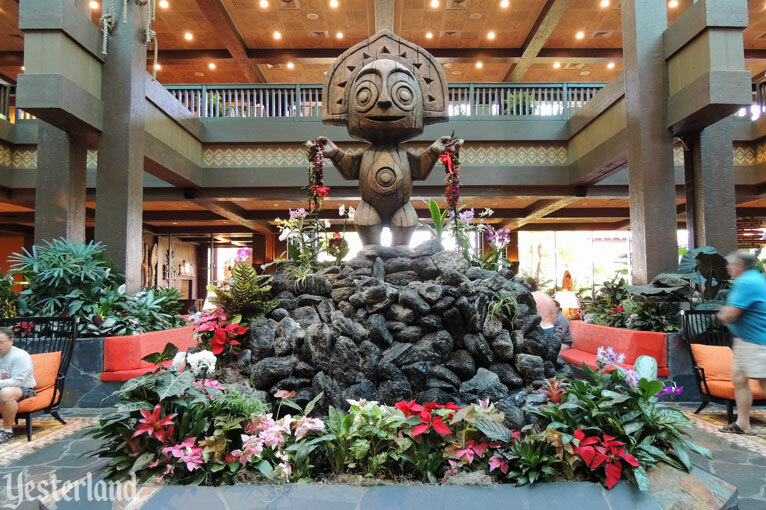 The Polynesian Resort is a delightful place to visit for a meal in one of the themed restaurants or to stay a few nights in a tropically decorated room. The waterfall garden in the Great Ceremonial House will be there forever, right? Such a big, imposing feature would be too difficult to remove. Polynesian Village was one of two Disney hotels when Walt Disney World opened October 1, 1971. The other was the Contemporary Resort. In 1985, Polynesian Village became Disney’s Polynesian Resort, without “Village” in its name. In 2014, “Village” returned, giving the resort its current name, Disney’s Polynesian Village Resort. The floor around the waterfall garden was originally covered by a checkerboard pattern of square blue and green tiles. Smaller tiles covered the walls around the garden. The mood is set by a 3-story-high garden that occupies most of the lobby. To call the construction at the center a fountain is to do it a grave injustice; it’s more like a waterfall that a wanderer might suddenly come upon in the jungle. The water cascades over craggy volcanic rocks. Coconut palms tower over 250 square feet of some 75 different species of tropical and subtropical plants—1,500 anthuriums, banana trees, ferns, gardenias, orchids, and other greens. The climatic conditions are nearly perfect, so everything is verdant year round. The natural rock slab floors and walls in the photos above were installed during a major update to the Great Ceremonial House in 1996. 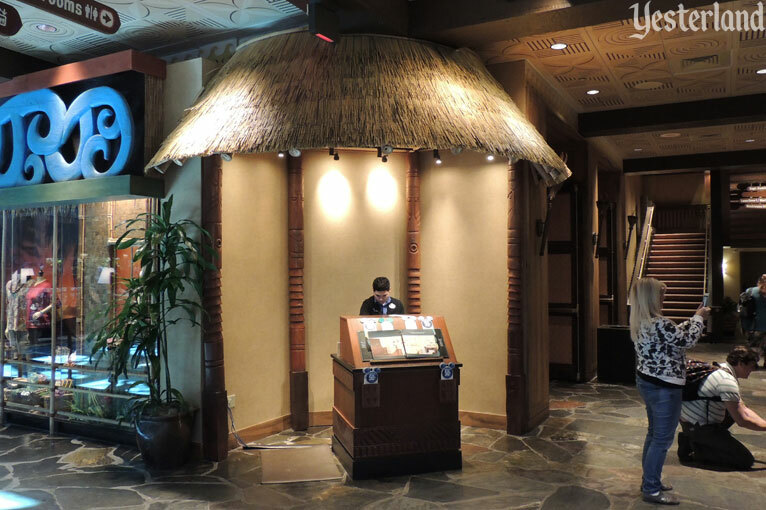 On May 2, 2014, the Disney Parks Blog published a short entry announcing that, “As part of a complete re-imagining, Disney’s Polynesian Resort is returning to its original, 1971 opening day name: Disney’s Polynesian Village Resort.” Four images accompanied the entry. One showed a sign on a lava rock wall with the new name spelled out in Blippo Bold, an iconic 1970s font. Two showed renderings of “Trader Sam’s Grog Grotto – based on the popular themed lounge at the Disneyland Hotel in Anaheim, Calif.” Many fans were thrilled that Trader Sam’s was on its way to Florida. But one image caused alarm among many loyal fans of the Polynesian Resort. It’s not what the image showed; it’s what it didn’t show. 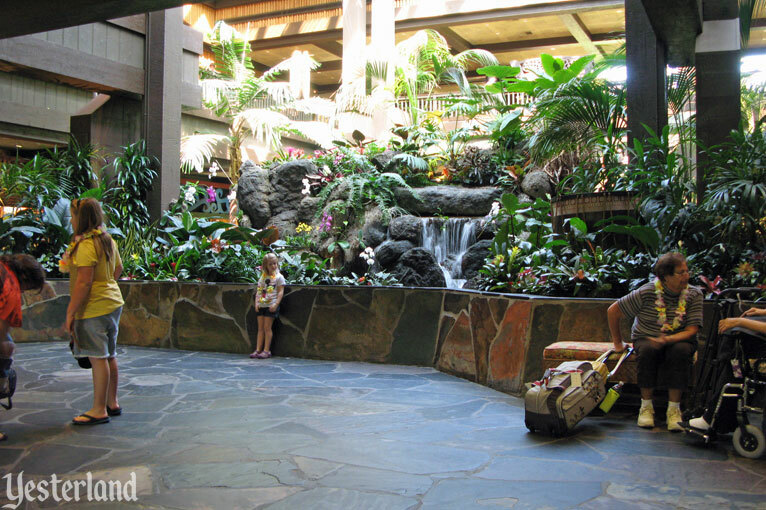 The waterfall garden was missing from the “Re-Imagined” lobby! As construction walls went up around the waterfall garden, fans posted their disappointment on forums, Facebook, and blogs—even on the Disney Parks Blog itself. Keith Mahne, the owner and producer of the Disney Avenue blog and the Disney Avenue Podcast, initiated a petition on Change.org that attracted more than 2,600 supporters. Here are a few sentences from the petition. Removing the waterfall from the lobby is like removing Cinderella Castle from the Magic Kingdom. 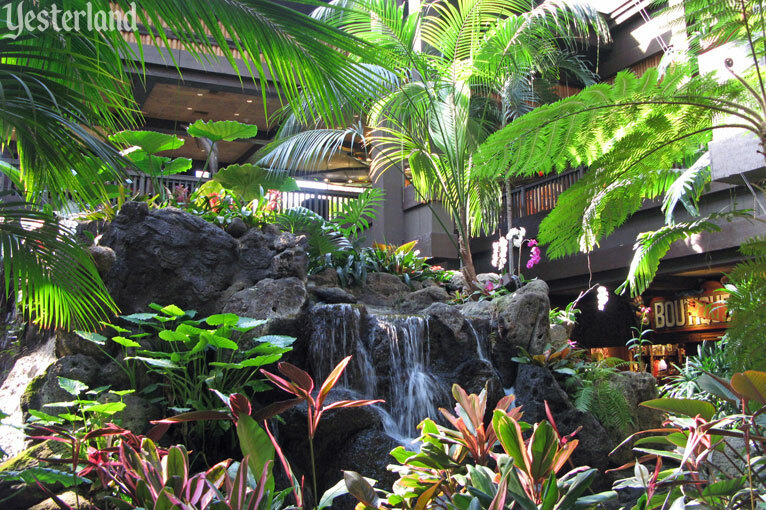 There are many with the opinion that the tropical waterfalls in the lobby make the hotel feel ‘Polynesian’ and that it is the centerpiece of the resort. Several people visit the resort during their stay at other WDW resorts just to see it and be reminded of their childhood. We always schedule a breakfast during our trips there specifically for that waterfall as I know others do. If they do move forward with its removal, there will be many sad and disappointed guests. One can only hope that this petition will open the eyes of Disney management so that they will reconsider this change. 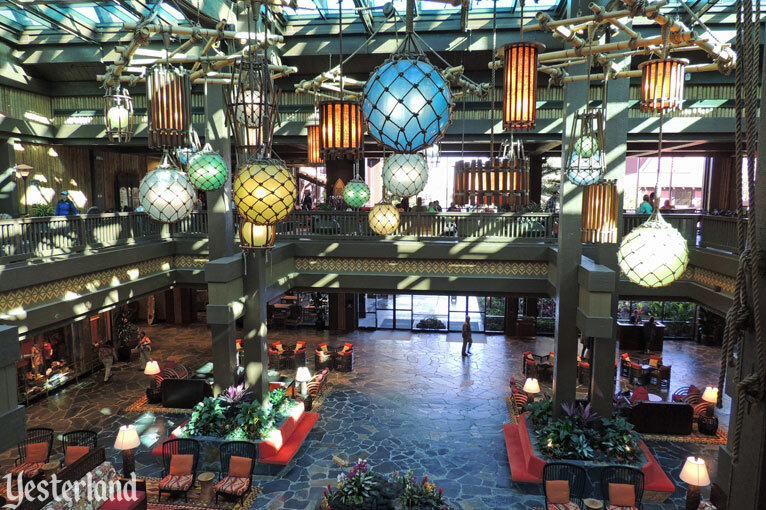 The new look will set the tone for visitors to the Polynesian, which opened with Walt Disney World in 1971. “You’ll feel you have arrived in a relaxing South Seas kind of experience,” said Tom Wolber, senior vice president for resort operations. For decades, the centerpiece of the Great Ceremonial Hall has been a large waterfall. It is going to be removed. More space is needed because of the amount of foot traffic at the Polynesian, Disney officials have said. Even more people will be there after the Disney Vacation Club opens waterfront villas at the Polynesian next year. “I think this will provide a lot of relief and open space and give everybody enough room,” said Debbie Petersen, creative development executive for Walt Disney Imagineering. The waterfall removal also will enable guests to see the lagoon from the lobby. In addition to the official reasons, there was speculation that the high cost of maintaining the aging water feature, dealing with moisture, and controlling bacteria also contributed to the decision to remove it. In December 2014, the construction walls came down. The beloved waterfall garden was gone. Or, it could be said that the waterfall garden shrunk down to a tiny fraction of its former size. 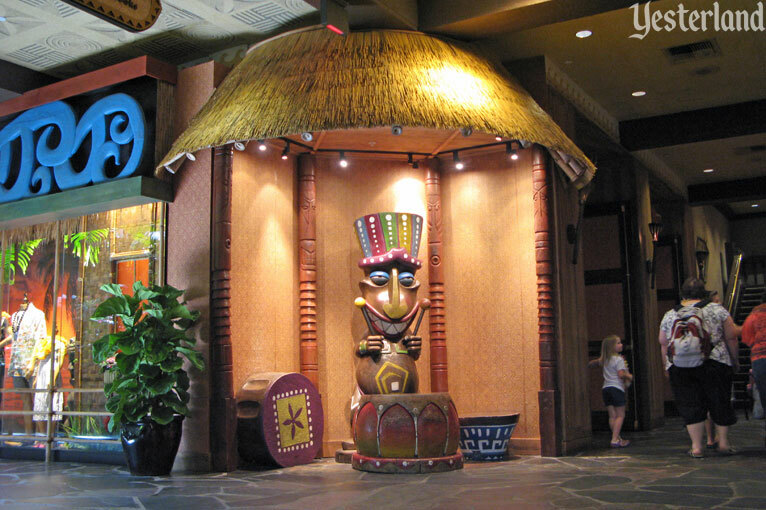 An odd change is that there’s now a Disney Vacation Club (DVC) kiosk where the tiki drummer previously stood. It looks temporary. 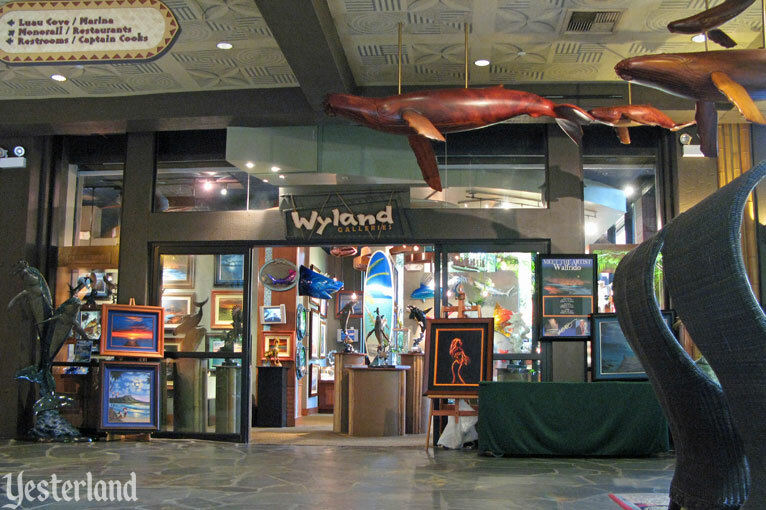 Another change is that Wyland Gallery closed permanently at the end of 2013. Its space is now used by Pineapple Lanai (serving Dole Whips and other treats) and by a DVC office. There’s still a Wyland Gallery at Disney’s BoardWalk Resort. 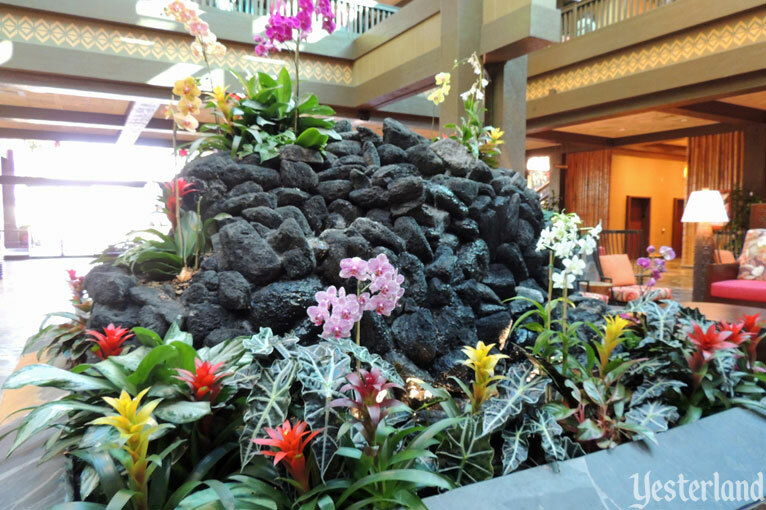 With the addition of a tiki atop the small waterfall garden in 2015, the new lobby was complete. 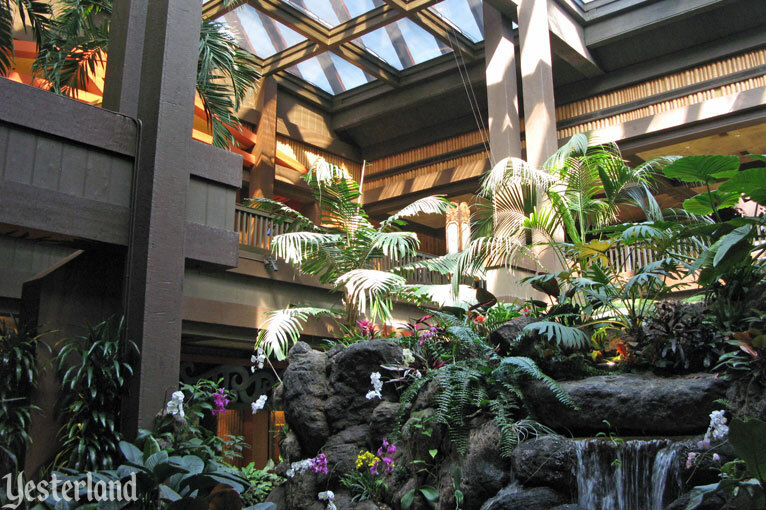 Even without the huge waterfall garden, the lobby exudes a restful tropical atmosphere. Anyone who was afraid the updated Great Ceremonial House would come across as a generic hotel lobby need not have worried. Disney’s goal of providing a “relaxing South Seas kind of experience” with more room for guests has been successful. Hawaiian music fills the air. New planters surround the columns. Patterns, colors, textures, and materials harmoniously contribute to the desired effect. But there’s no getting around that the Polynesian no longer includes what many guests considered to be its signature and its heart.